In terms of cultural history, Les Roussillonnais of southwest France have as much in common with their Catalan neighbours in Spain as they do with their Occitan-speaking cousins in the adjacent territory known as Pays de Langue d’oc (Languedoc). Through most of the medieval period, Roussillon vacillated as a border region between these two peoples, though was mostly ruled by the Counts of Barcelona as a part of Catalonia. In the modern age, it has deferred to its French heritage and become bound up in Languedoc-Roussillon. More than just a political marriage, it’s a hybrid of Mediterranean shorelands and craggy inland geography; framed by the Rhône River Valley to the east, and the Pyrenees that divide Spain and France to the west. The wine world, however, still references these twinned regions as separate sets of distinct winemaking terroirs, and so we should! 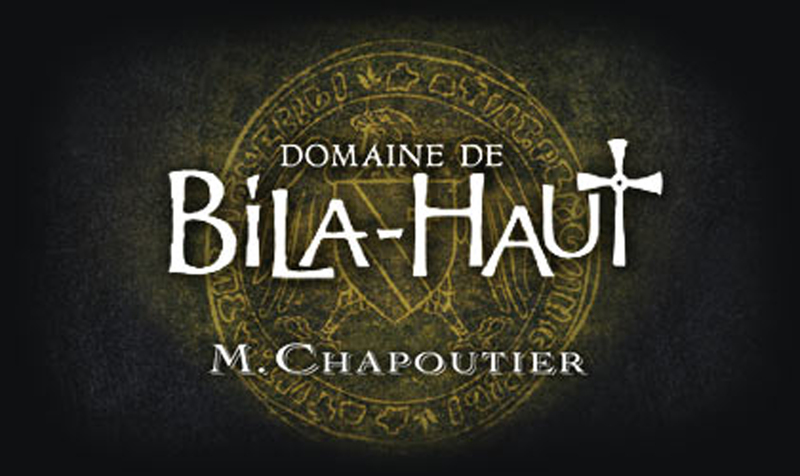 Originally founded at the turn of the 19th century, the Maison M. Chapoutier has progressively built up and expanded its broad portfolio of mature vineyards next door in the Southern Rhône. In recent decades, it continues to forge ahead with new properties and partnerships in various parts of Roussillon, while also applying organic growing practices throughout both regions. 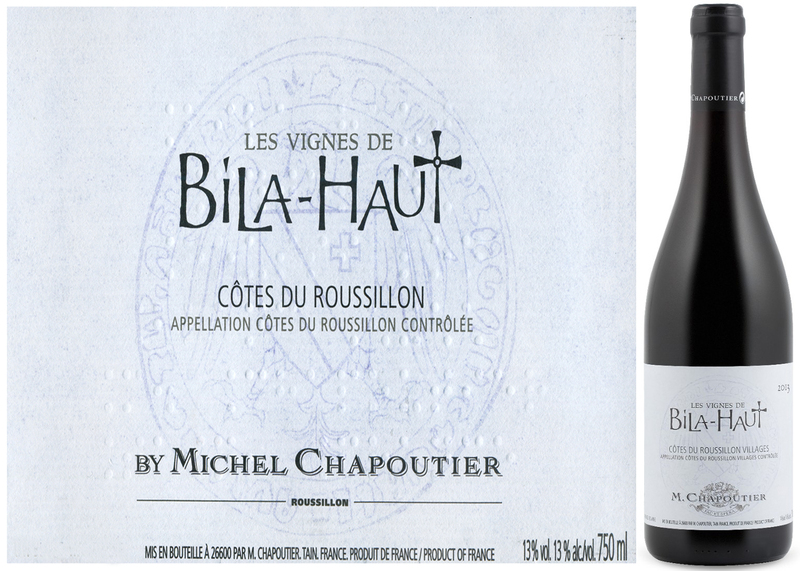 For this bottling, the fruit comes from younger plots in the Côtes-du-Roussillon Villages AOP. Part of the hilly, northern reaches of Roussillon, this appellation encompasses 32 towns in one of the sunniest areas of France–where cool winters, hot summers, moderate levels of rainfall, and the drying Mistral breezes combine to create peak growing conditions for the dark-skinned grape varieties now thriving there. 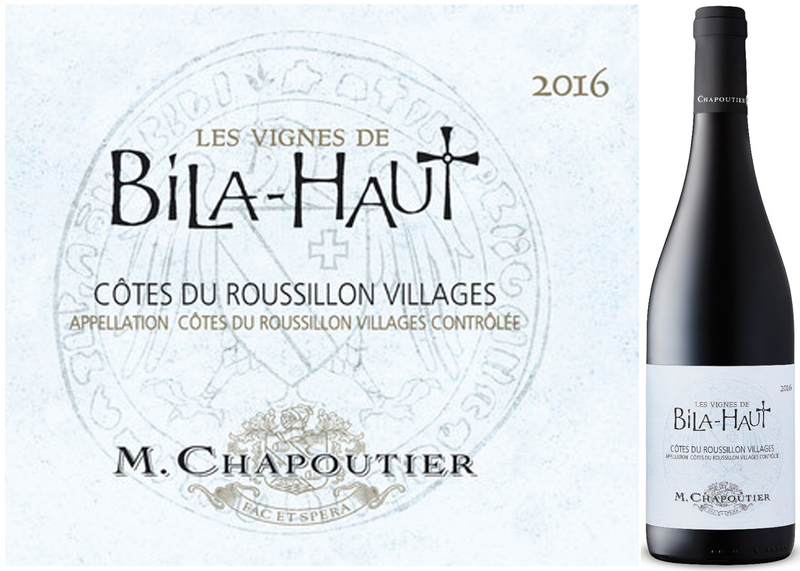 Clinging to slopes of the high Agly Valley, terraced vineyards are the source for this weeks’ DéClassé feature of Vignes de Bila-Haut 2016. 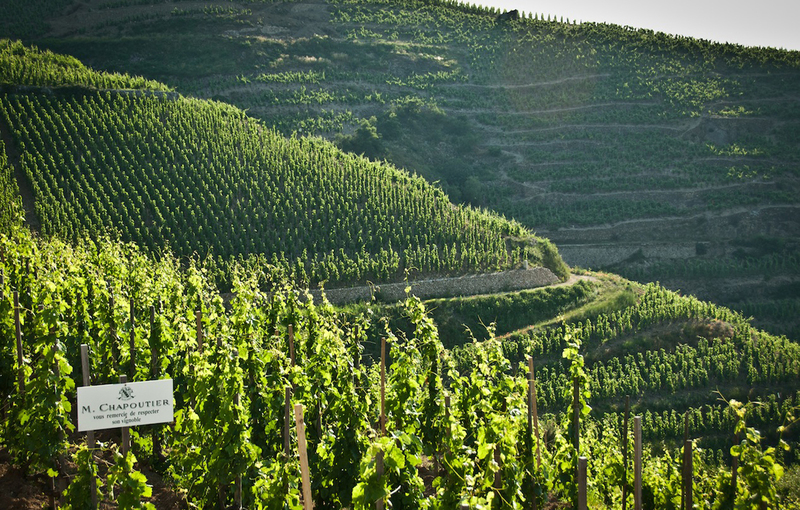 Poetically described by vintner, Michel Chapoutier, as “an old plot of land, rough, almost hostile,” his references illustrate ancient geology made up of crushed gneiss and schist: mineral-rich types of sedimentary rock laden with limestone and chalk deposits. It’s taken some time for Roussillon’s winemakers to evolve an understanding that these scrubland outcrops are highly conducive to grapevines that yield fulsome, yet still bright and lively red wines. Evidently, the winemaking team at M. Chapoutier has figured it out. Using only hand-harvested grapes, this blend incorporates three of the AOP mandated varieties: Syrah, providing spice and aromas reminiscent of the local garrigue (fragrant wild shrubs); Black Grenache to add firmness and body, and the region’s signature grape, Carignan, offering some crisp tannic notes. Aiming to create a fresher style of red, the Chapoutier recipe never sees an influence of wood barrels; instead, it’s briefly aged in vats to produce wine that’s intended to be enjoyed young over the next several years. It’s time to reaffirm what so many prudent LCBO Vintage’s customers already know: if you want to inexpensively invigorate both patio and indoor dinners in the many months to come, then dare to buy a whole case! Deep garnet red with dark berry flavours, accented by vanilla and spice notes, this is a pleasingly uncomplicated, rustic wine. Try with grilled lamb chops, lentils with spicy sausage or a Ratatouille made with fire-roasted vegetables. In terms of cultural history, Les Roussillonnais of southwest France arguably have as much in common with their Catalan neighbours in Spain as they do with their Occitan-speaking cousins in the adjacent territory known as Pays de Langue d’oc (Languedoc). Through most of the medieval period, Roussillon vacillated as a border region between these two peoples, though was mostly ruled by the Counts of Barcelona as a part of Catalonia. In the modern age it has deferred to its French heritage and become bound up in Languedoc-Roussillon. More than just a political marriage, it’s a hybrid of Mediterranean shorelands and craggy inland geography; framed by the Rhône River Valley eastward, and the Pyrenees that divide Spain and France to the west. The wine world, however, still references these twinned regions as separate sets of distinct winemaking terroirs, and so we should! 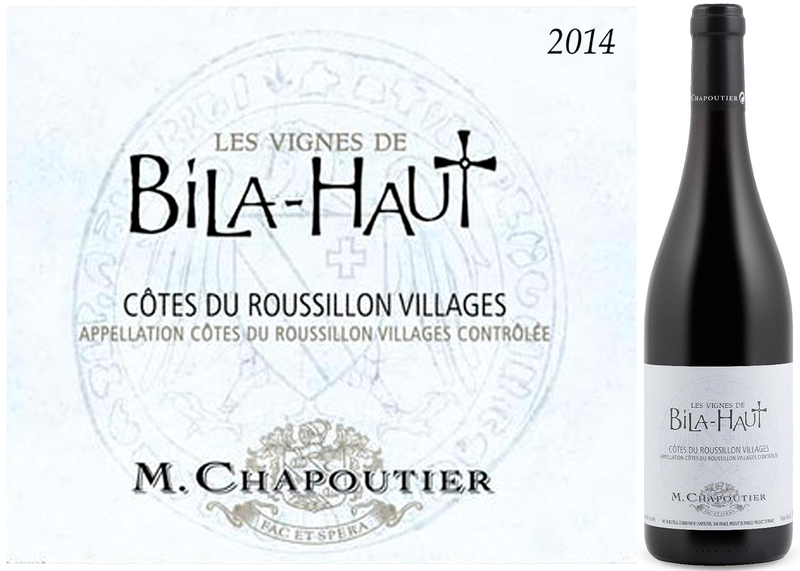 Originally founded at the turn of the 19th century, the Maison M. Chapoutier has progressively built up and expanded its broad portfolio of mature vineyards next door in the Southern Rhône. In recent decades, it continues to forge ahead with developing new properties and partnerships in various parts of Roussillon while also applying organic growing practices. For this bottling, the fruit comes from younger plots in the Côtes-du-Roussillon Villages AOP. Part of the hilly, northern reaches of Roussillon, the appellation encompasses 32 towns in one of the sunniest areas of France — where cool winters, hot summers, moderate levels of rainfall, and the drying Mistral breezes combine to create peak growing conditions for the dark-skinned grape varieties now thriving here. Clinging to slopes of the high Agly Valley, terraced vineyards are the source for this weeks’ DéClassé feature of Vignes de Bila-Haut 2016. Poetically described by vintner, Michel Chapoutier, as ‘an old plot of land, rough, almost hostile,’ his references illustrate an ancient geology made up of crushed Gneiss and Schist: mineral-rich types of sedimentary rock laden with limestone and chalk deposits. It’s taken a while for Roussillon’s winemakers to build an understanding that this landscape of heaved prominences and scrubland outcrops is highly conducive to cultivating the sorts of grapevines that will yield fulsome yet still bright and lively red wines. Using only hand-harvested grapes, this assembled blend incorporates three of the AOP mandated varieties: Syrah, providing spice and aromas imparted from the wild Garrigue of fragrant, flowering shrubs; Black Grenache to add firmness and body, and the region’s signature grape, Carignan, offering some crisp tannic notes. Aiming to create a fresher style of red, his recipe never sees an influence of wood barrels, rather it’s briefly aged in vats; producing a wine that’s intended to be enjoyed young over the next several years. It’s time to reaffirm what so many prudent LCBO Vintage’s customers already know: if you want to warmly invigorate dinners in the cold winter months to come, inexpensively – then dare to buy a whole case! In terms of cultural history, Les Roussillonnais of southwest France arguably have as much in common with their Catalan neighbours in Spain as they do with their Occitan-speaking cousins in the adjacent territory known as Pays de Langue d’oc (Languedoc). Through most of the medieval period, Roussillon vacillated as a border region between these two peoples though was mostly ruled by the Counts of Barcelona as a part of Catalonia; in the modern age it has deferred to its French heritage and become bound up in Languedoc-Roussillon. More than just a political marriage, it’s a hybrid of Mediterranean shore lands and craggy inland geography; framed by the Rhône River Valley eastward, and the Pyrenees that divide Spain and France to the west. The wine world, however, still references these twinned regions as separate sets of distinct winemaking terroirs, and so we should! Clinging to slopes of the high Agly Valley, terraced vineyards are the source for this weeks’ DéClassé feature of Vignes de Bila-Haut 2014. 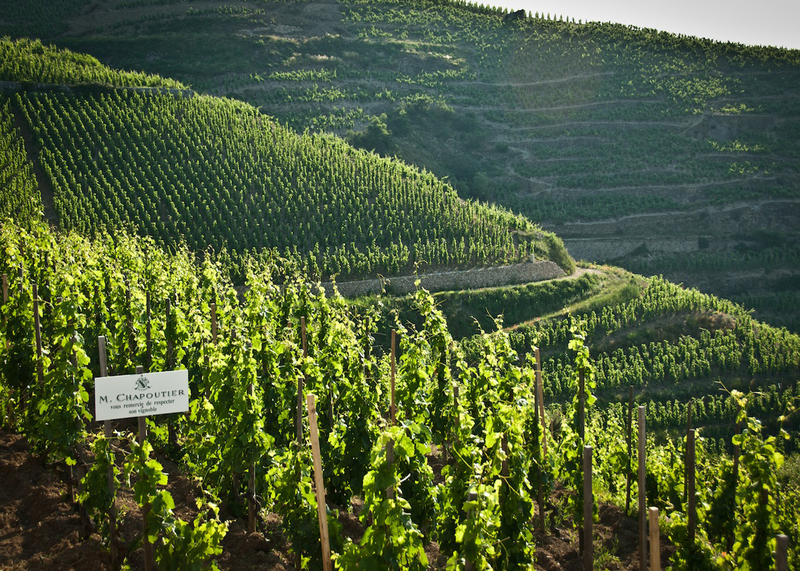 Poetically described by vintner, Michel Chapoutier, as ‘an old plot of land, rough, almost hostile,’ his references illustrate an ancient geology made up of crushed Gneiss and Schist: mineral-rich types of sedimentary rock laden with limestone and chalk deposits. It’s also taken a while for Roussillon’s winemakers to discover and build an understanding that this landscape heaved into prominences and scrubland outcrops, is highly conducive to cultivating the sorts of grapevines that will yield fulsome yet still bright and lively red wines. Using only hand-harvested grapes, this assembled blend incorporates three of the AOP mandated varieties: Syrah, providing spice and aromas imparted from the wild Garrigue of fragrant, flowering shrubs; Black Grenache to add firmness and body, and the region’s signature grape, Carignan, offering some crisp tannic notes. Aiming to create a fresher style of red, his recipe never sees an influence of wood barrels, rather it’s briefly aged in vats; producing wine that’s intended to be enjoyed young over the next several years. It’s time to reaffirm what so many prudent LCBO Vintage’s customers already know: if you want to invigorate patio dinners in the months to come, inexpensively, then dare to buy a whole case! Deep garnet red with dark berry flavours, hints of vanilla and spice notes, this is a pleasingly uncomplicated, rustic wine that could stand to be chilled slightly when served during the summer heat. Try with grilled lamb chops, lentils with spicy sausage or a Ratatouille made with fire-roasted vegetables.